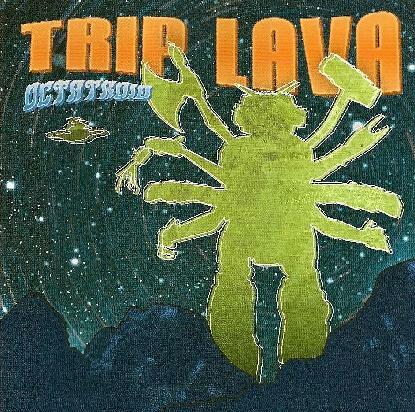 Trip Lava is the one-man project of Joel Lee, and his album, in keeping with the theme, is a heavy balls-out prog-rock assault, Lee being somewhat of an "Octatroid" himself (attacking with an arsenal of roughly 8 noise-weapons: drums, machines, wah guitars, distorted bass, organ, keyboards, laser synths and various other fx). You're probably meant to imagine this as a soundtrack for an '80s alien-warship video game, 'cause that's what the dramatic narration of the liner notes seem to evoke, the album telling the tale of our robot-hero rescuing innocent villagers from the evil space-invader Gurgblah. Octatroid (conjured by Zidrakong the Sorcerer) is named for his arsenal being made up of 8 weapon-appendages: fists, claw, hammer, ax, etc. The Search for Zidrakong has a lighter, more playful feel to it than most of these tracks. Things are pretty frenetic and schizoid throughout, all instrumental, not unlike the Vas Deferens Organization, though more organic... maybe some Magma, too. Even interlude Octatroid Must Rest barely mellows the pace for but a minute. The closer Peace Returns touches down nicely, finally offering relief with pleasingly soft keys. But after all that can be said about the theme, instrumentation and production, most of the music itself didn't really move me, kinetically or emotionally. It's not that it's particularly derivative, unadventurous, or merely academic... probably just too progressive for my taste.